Over the next month key members of the STP team will be selecting their top 5 favourite pieces of furniture from the archives. They could be old, they could be new, there is nothing borrowed, but there is something blue! It may be that they loved the design, or some technical aspect of making it. It may be the timber or the combination of materials. There will be an image plus little explanation of why they selected it. First up is John. John Beaves joined Simon in 2000 after completing the HND Furniture Course at Buckinghamshire University. 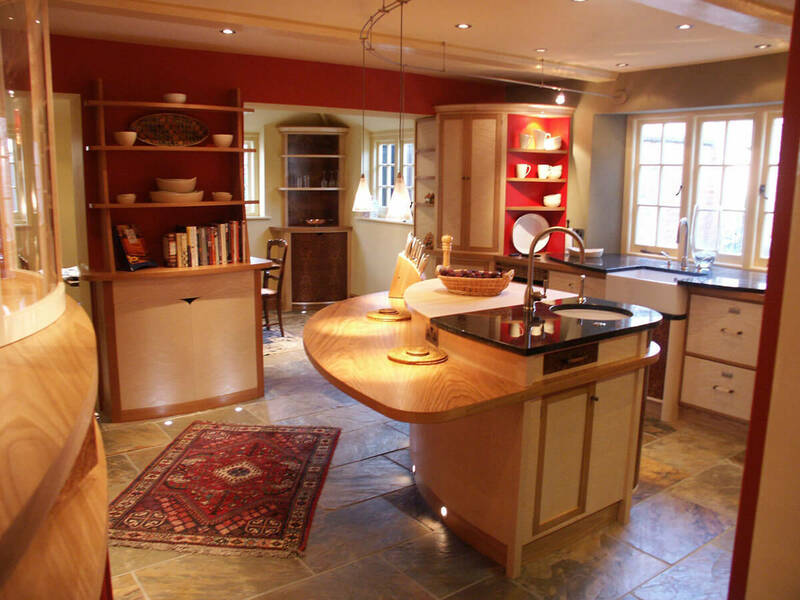 Now an experienced cabinet maker with an eye for detail, John became a director of Simon Thomas Pirie Ltd in 2007 when the business expanded and moved. As well as being ‘on the bench’, much his role now focuses on the management of what goes through the workshops here at Briantspuddle. In a sense this piece was a bit on an accident. The original intention was to completely open the space up but it was less expensive to leave a pillar in what was originally an outdoor load-bearing wall. Simon had to design something that would hide the pillar and become a stunning feature piece in its own right. All our kitchens feel more like a collection of furniture pieces rather than ‘fitted’ units, but that’s especially true of this. We played around with leading the eye to the back corner of the room to make it seem larger with another cabinet, this time in burr elm. This kitchen is in a lovely Georgian house on the edge of the New Forest, and as first kitchens go it’s a pretty impressive one. 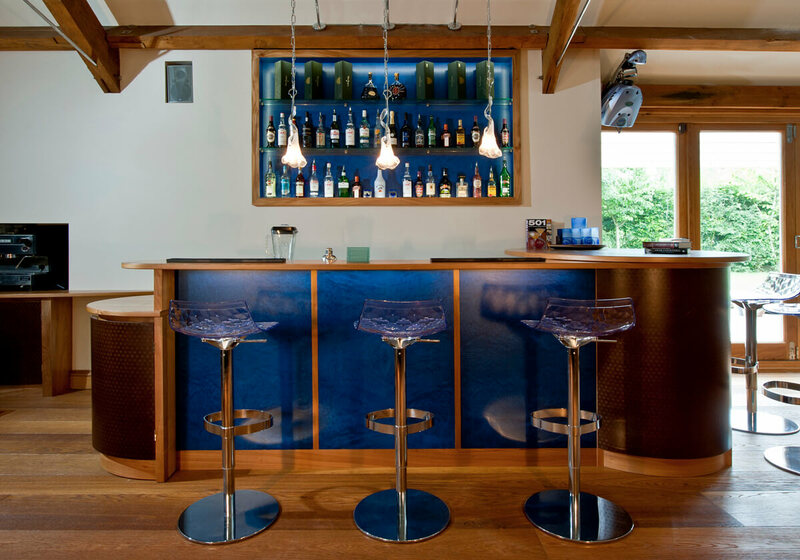 We worked with interior designer Yvonne Hellier on this project which was great fun”. 4. Is the Impala dining chair. 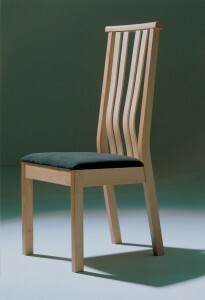 Originally designed as a restaurant chair it soon became our best seller in the domestic environment. “We have lost count of how many we have made but at a rough guess we think it’s around 250 since 2000 when the oak prototype pictured was designed and made. To see the full case study and more images of this project click here. 2. “I suspect this would have made everyone here’s list, but I’m first so I get it on mine. 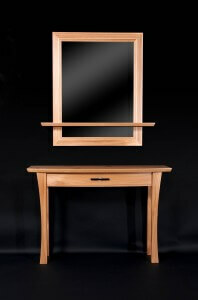 The elm console table with matching mirror. Everything has a curved front including that dissecting shelf on the mirror. The elm is offset with sycamore details and a drawer handle made from the most subtle of walnuts – an English grown black (or Virginia) walnut. We have made a few of these in various woods, but this was the first and my favorite because the elm was so beautiful- full of pippy cat-paw burrs. Over the years i’ve really grown to love elm, it’s full of characterful grain and unusual colours – greens, silvers, reds and browns. That does make it difficult to select and use, but get it right and it’s wonderful. Most of ours comes from Scotland these days, but the disease does continue to spread north, especially when we have mid winters. Lets hope one day elm makes a return in our countryside. 1. So, here it is, John’s very favorite piece of all time. 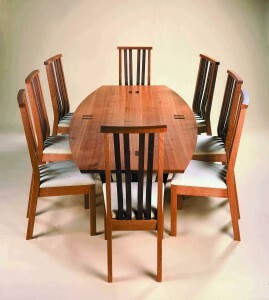 The ‘Lozenge’ dining table. Again, it’s something that may well have made all our lists. “Lozenge refers to the shape of the top, an oval with straight ends, it’s not only an elegant shape but very practical, fitting into most modern spaces (which are rectangular) and allowing a more organic flow around it. Not only that but as the longs sides carry the curve you can actually see everyone who’s on the same side of the table as you. It’s a very sociable shape. This one is in the classic timber combination of an oak top with a walnut underframe. The other thing I love about this table is the lovely curved frame and leg structure. Those beams are made of a reformed solid laminates – lots of thin strips of wood from the same board glued back together in sequence. We colour the glue so you just cant tell it’s been laminated. It’s very strong and it’s no accident it looks a bit like a bridge – Simon loves looking at bridge’s and structures, he’s even designed a few! The other detail I like is the way the double leg detail appears to come through into the top, we actually rout an end-grain blocks into the top which is very effective. That shot of the table side on showing the curved beam structure is an image I never get bored of. We have used it in every brochure we have done. We actually have a lozenge table for sale in oak and walnut which is coming back from a client who has just moved house and down-sized. It’s a bit big for their new living space so we are designing them something else. It’s in very good condition but we will refinish it anyway. Seats 6 to 8. Size: L200m x W110cm (widest at centre) x 75cm high. Sale price £2500, which is half the cost of a new one to commission. For further details and images contact Simon.